Perimeter Drainage has the right excavation equipment to tackle any small job. We have a good variety of Kubota Excavators to tackle any job. 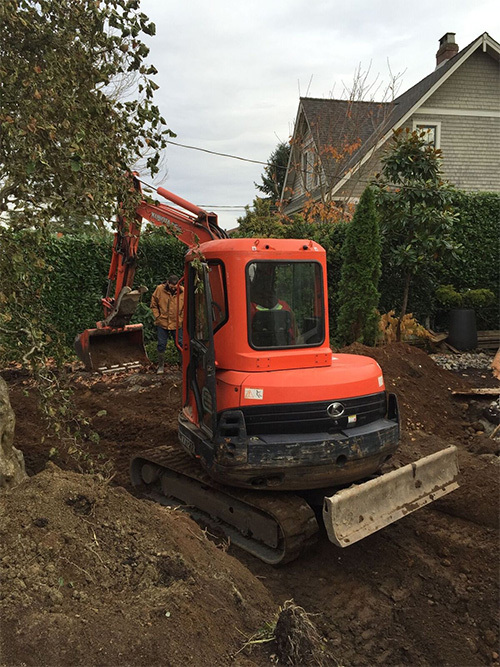 With over 25 years of experience in excavation, Perimeter Drainage should be able to handle any sized residential job. We have different sized excavators for all different jobs. Our Kubota KX008 is a great little machine that is used for digging water mains. Its small size reduces the overall damage to properties during emergency excavations. It has expandable tracks from as little as 28″ to 34″. Click here to view their specifications. Our Kubota KX41 is great for tight spots. It has expandable tracks from 39″ to 54”. This is a perfect machine for replacing drainage and sewer systems, or small excavations. This machine can dig up to 7′-8″. Click here to view their specifications. Our NEW Kubota U35 is a great small machine for residential excavations. Zero tail swing makes it a perfect for digging around foundations, digging sewer and water services. Our Kubota U55 digs depths up to 11′-10″. It is very powerful durable, dependable, and versatile. Track width of 78” and machine weight of 12,300 lbs for many applications. This machine can be used for small demolition and excavations. Click here to view their specifications. Add our bin trucks for demolition, site clearing. Machine or hand load bins full of dirt, concrete or asphalt and you have a full package for anything you need to make your job site efficient. Call us at 604-988-4545 to view your site and see if we can help.